New window film reduces bird collisions: The new “CollidEscape” film on the wildlife viewing window is designed to reduce the number of birds colliding into the glass. The film works by reducing the transparency and reflectivity of the exterior glass surface. So far the number of collisions has dropped to less than one tenth of the number before the film was applied. 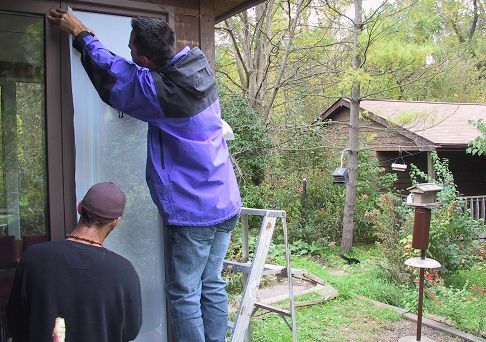 The film also makes it much harder for birds and wildlife to see inside so people are less likely to disturb wildlife as they look through the window. Monday, Nov 26: A Rufous Hummingbird has appeared in Kingsville. Janet Tuite told us about a hummingbird coming to a feeder in Kingsville last week. As Ruby-throated Hummingbird has never been reported this late in the fall we suspected this was something different. 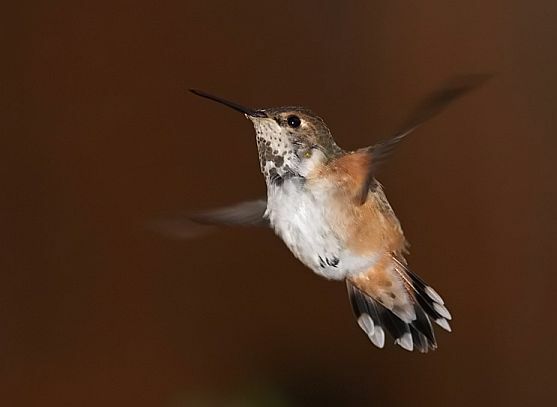 Paul Pratt visited the feeder on November 22 and determined it was an adult female Rufous or Allen's Hummingbird. The two species are extremely similar and usually have to be examined in-hand to confirm the identification. Carl Pascoe and Rachel Powless who are licensed hummingbird banders agreed to try and catch the bird on the weekend. They managed to band the bird and confirm that it was an after hatch year female Rufous Hummingbird. This is only the second Rufous Hummingbird ever banded in Ontario. The bird continues to visit the feeder at 95 Queen Street in Kingsville (feeder is visible from front sidewalk). A special Thanks to Pam and Chris Heil for maintaining the feeder and allowing visiting birders to see this remarkable bird. Monday, Nov 19: Northern Saw-whet Owl banding by HBMO at Holiday Beach continues to produce impressive results this fall (see Oct Sightings). A record 113 owls were banded last night bringing the fall total to 483! In comparison only 126 were banded during last year's banding. Wednesday, Nov 07: A female Evening Grosbeak has been coming to the feeders at Ojibway yesterday and today. This is the first one in several years to visit the feeders. We also have a few Purple Finches, Tufted Titmice and three Fox Sparrows at the feeders. Sunday at Holiday beach there were many Pine Siskins and a single Common Redpoll mixed in with the large numbers of American Goldfinches migrating along the shoreline. Sunday, Nov 04: Ojibway's field trip to Holiday Beach was highlighted by lots of action. We saw photos of a Great Blue Heron swallowing a Muskrat, watched a Pied-billed Grebe try to choke down a frog, observed an adult Bald Eagle catch and pluck a female Gadall, and we were mesmerized by a large Bullfrog as it forced a squirming Leopard Frog down its throat. Other sightings included an adult Peregrine Falcon making repeated dives at a perched Red-tailed Hawk and getting great views of Rusty Blackbirds and Wilson's Snipe. Thousands of waterfowl dabbled in the marsh while crows, blackbirds and finches provided the bulk of the migrants passing by the tower. 68 species were recorded for the morning. Friday, Nov 02: The number of Northern Saw-whet Owls banded by HBMO at Holiday Beach continues to increase. A record 77 were banded last night!